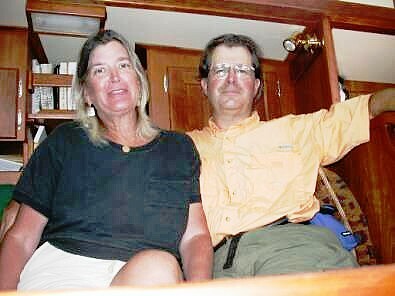 In which Larry and Susan Shick set forth their post-retirement wanderings on Moira, their 42-foot Valiant sailboat. I (Susan) would like to share our (Larry and Susan’s) experiences, both the highs and lows, and I will try to post my thoughts on our additional adventures from time to time. At this writing (August, 2015) Moira is “on the hard” in Annapolis, Maryland, awaiting our return from a land trip to Maine. You can follow our wanderings on the Shiptrak website as we plunge onward. Here is a summary of our travels to date, in chronological order. Click on any link for the details. These are primarily Susan’s pages. The Photo Album Tons of photos that we didn’t have space for on the web pages, and higher-resolution copies of your favorites. Check it out! The Christmas Cards now have their own folder in the photo album. These are primarily Larry’s pages. Here is an article I wrote on the subject of risk management, or contingency seamanship. Here is a mind-map on the elements involved in passage planning. Where I try to put down the rules of seamanship that we live by. We belong to the Seven Seas Cruising Association (SSCA), a mostly-unstructured group of those who have chosen to live on, and travel by, water. The Association publishes a Bulletin once a month, made up mostly of letters from members about their experiences in various destinations. In February, 2008 the Bulletin began a column called “Dreamer’s Prism” for those who are dreaming, or hoping, or planning, to move out among us. In November, 2008, the editor began issuing challenges to long-term members, posing questions the answers to which might help those less experienced. We have responded to several of the challenges. The perennial question in the anchorage: “What flag is that?” This is a simple (but bulky, 5MB) tool to assist you in discovering that your neighbor is from, say, Saint Pierre and Miquelon. Download, unzip (retaining the directory structure), and see the README. The gearheads in the group may want to have a look at the projects we undertook to make Moira function as a self-sufficient home and cruising sailboat. Student’s notes for a class on “How to be an intelligent consumer of weather products (e.g., weatherfax).” Click here for download options. A sheet of useful facts I post on my nav station. Stuff I don’t use often enough to memorize, but stuff that—when I want it—I want it now! Like USCG emergency frequencies, speed increase needed to justify footing rather than pointing, how to set frequencies in my ICOM M710, and like that. Click here for download options. In December, 1944, vessels of the US Pacific Fleet sustained heavy damage, with several sinkings and much loss of life, as a result of a wartime encounter with a typhoon near the Philippines. Admiral Nimitz wrote this “PACIFIC FLEET CONFIDENTIAL LETTER 14CL-45” to drive home the lessons learned. In between the lines of military-ese is the most remarkable short essay on seamanship I have ever read. We are members of the Seven Seas Cruising Association and support its Clean Wake Policy.